This image of the elliptical galaxy NGC 1132 and its surrounding region combines data from NASA's Chandra X-ray Observatory and the Hubble Space Telescope. 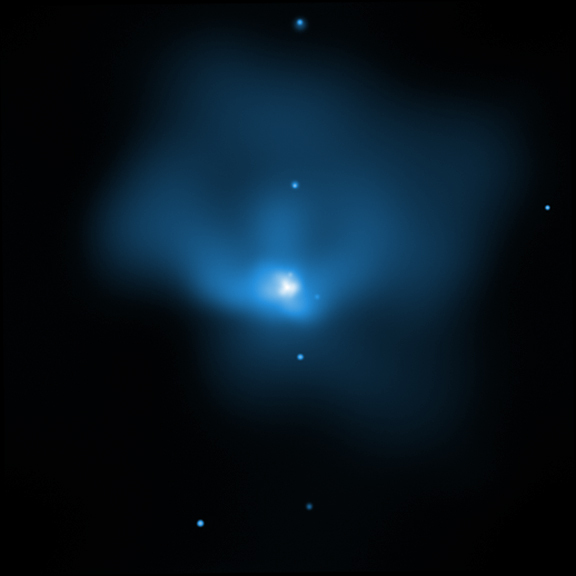 The blue/purple in the image is the X-ray glow from hot, diffuse gas detected by Chandra. Hubble's data reveal a giant foreground elliptical galaxy, plus numerous dwarf galaxies in its neighborhood, and many much more distant galaxies in the background. Astronomers have dubbed NGC 1132 a "fossil group" because it contains an enormous amount of dark matter, comparable to the dark matter found in an entire group of galaxies. Also, the large amount of hot gas detected by Chandra is usually found for groups of galaxies, rather than a single galaxy. The origin of such fossil-group systems remains a puzzle. They may be the end-products of the complete merging of groups of galaxies. Or, they may be very rare objects that formed in a region or period of time where the growth of moderate-sized galaxies was somehow suppressed, and only one large galaxy formed. 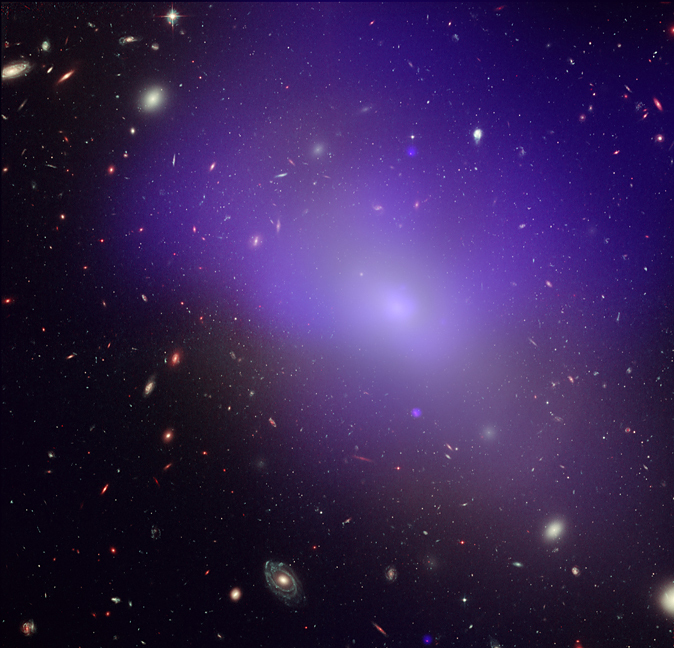 Elliptical galaxies are smooth and featureless. Containing hundreds of millions to trillions of stars, they range from nearly spherical to very elongated shapes. Their overall yellowish color comes from the aging stars. Because elliptical galaxies do not contain much cool gas, they can no longer make large numbers of new stars. Scale Image is 3.26 arcmin across. Coordinates (J2000) RA 02h 52m 51.9s | Dec -01° 16´ 28.0"